Shifting freight transport to rail has its limitations. Therefore, a share of this transport will need to be carried out by trucks that combine reliable service with minimum environmental impact. The eHighway system is twice as efficient as conventional internal combustion engines. This Siemens Mobility innovation supplies trucks with power from an overhead contact line. As a result, not only is energy consumption cut by half but local air pollution is also reduced. In August 2017, Siemens Mobility was commissioned by the state of Hesse to build an overhead contact line for electrified freight transport on a ten-kilometer stretch of autobahn. With this field trial, the eHighway is being tested on a public highway in Germany for the first time. The system is installed on the A5 autobahn between the Zeppelinheim/Cargo City Süd interchange at the Frankfurt Airport and the Darmstadt/Weiterstadt interchange. In March 2018, a further contract was awarded by the Research and Development Center of the University Kiel for the construction of a five-kilometer eHighway on the A1 autobahn between the Reinfeld and Lübeck interchanges. Siemens has been commissioned by the German state of Hesse to build an overhead contact line for electrified freight transport on a ten-kilometer stretch of autobahn. The line will supply electricity for the electric drive of a hybrid truck. Siemens originally presented its innovative "eHighway" concept in 2012. The system will be installed on the A5 federal autobahn between the Zeppelinheim/Cargo City Süd interchange at the Frankfurt Airport and the Darmstadt/Weiterstadt interchange. In November 2017, Siemens Mobility installed and tested a two-mile-long overhead contact line system for hybrid electric trucks near the U.S. ports of Los Angeles and Long Beach, two of the largest ports in the country. Siemens demonstrates first eHighway system in the U.S.
Siemens and the "South Coast Air Quality Management District (SCAQMD)" are running a one-mile, zero-emission eHighway demonstration in the Californian city of Carson, U.S., near the ports of Los Angeles and Long Beach. 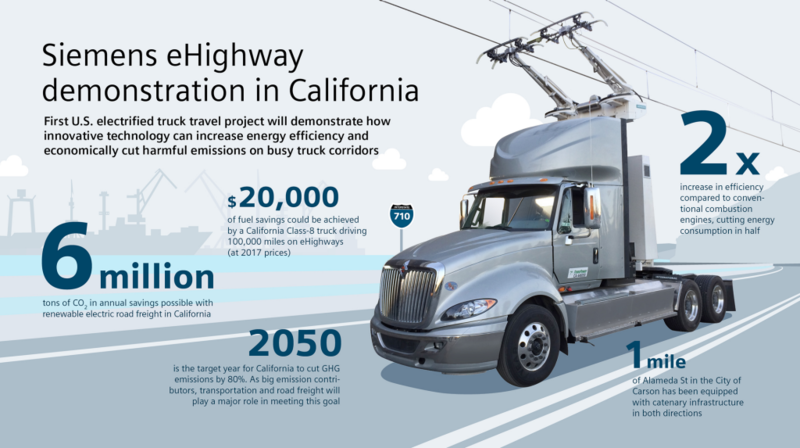 Siemens is to conduct demonstrations on a two-mile stretch of highway after installing a catenary system for electric and hybrid trucks in the vicinity of the largest US ports of Los Angeles and Long Beach. The company was awarded the associated contract by Southern California's South Coast Air Quality Management District (SCAQMD). The first eHighway system on a public road was inaugurated in June 2016 in Sweden. 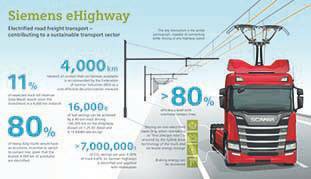 For two years, a Siemens Mobility catenary system for trucks was tested on a two-kilometer stretch of the E16 highway north of Stockholm. The system trial employed two diesel-hybrid trucks manufactured by Scania and adapted, in collaboration with Siemens Mobility, to operate with the catenary system. During the two-year trial, Sweden's transport authority Trafikverket and the district of Gävleborg gathered data to see whether the Siemens eHighway system is suitable for future commercial use and further expansion. As part of its climate protection strategy, Sweden has committed to having its transport sector independent of fossil fuels by 2030. Today sees the opening of the world's first eHighway in Sweden. The country's Minister for Infrastructure, Anna Johansson and Minister of Energy, Ibrahim Baylan inaugurated the first eHighway system on a public road. For the next two years, a Siemens catenary system for trucks will be tested on a two-kilometer stretch of the E16 highway north of Stockholm. 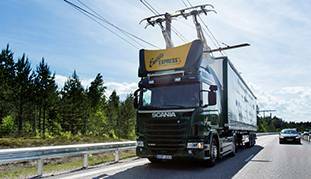 Siemens will install a catenary system for hybrid trucks in Sweden. The contract was awarded by the Swedish Transport Administration to the County Council of Gävleborg.